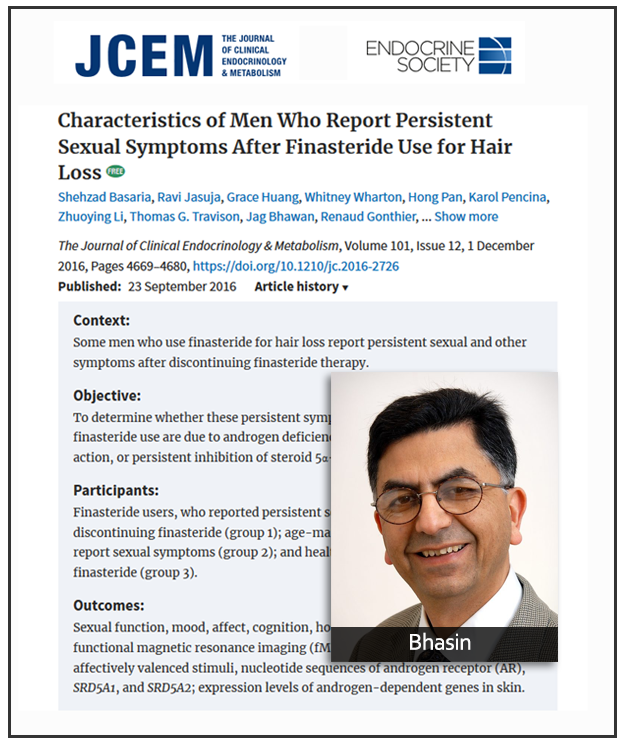 SOMERSET, N.J., Sept. 29, 2016 – Men who experience persistent sexual dysfunction after discontinuing finasteride have “neurobiological abnormalities,” suggests a new study published in The Journal of Clinical Endocrinology & Metabolism. Titled Characteristics of Men Who Report Persistent Sexual Symptoms after Finasteride Use for Hair Loss, the study was conducted at Brigham and Women’s Hospital in Boston by a team of 19 clinical researchers led by Shalender Bhasin, MD, a professor of medicine at Harvard Medical School. “The PHQ-9 depression scores were significantly higher” in symptomatic finasteride users. Beck Depression Inventory and Hamilton Depression Inventory “also revealed significantly higher depression scores” in symptomatic finasteride users. “This research has several firsts, including use of the latest functional MRI imaging to identify areas of the brain effected by PFS,” said Dr. John Santmann, CEO of the PFS Foundation, which funded the study along with Harvard Clinical Translational Research Institute and the Center for Clinical Investigation at the Brigham and Women’s Hospital. “It’s a landmark study that not only takes a significant step toward validating the condition on a biological level, but lays the groundwork for future studies that promise to yield effective therapies,” he added. Please download the full study here. As of Sept. 26, the World Health Organization Programme for International Drug Monitoring’s database of adverse drug reactions contained 13,546 finasteride ADRs, including 3,577 sexual function and fertility disorders, 1,526 depressed mood disorders and disturbances, and 67 completed suicides.